We made it back from Omaha (more to come on that later) yesterday. I went right back to work today. Came home and immediately got myself going again on the kitchen. I think we have all of the cabinets painted. And thank goodness for that! I am a tiny bit tired of painting. I’m a tiny bit tired of the house being torn up. I’m also a tiny bit tired of feeling like I can’t cook anything in my kitchen! I love it more and more every time I walk in there. And I know I’m getting to the fun part of adding some decorations. I’ll just say that I’ve been spending a lot of time on Etsy, Wayfair and Amazon lately. Oops! After a weekend of indulging I was definitely ready for something simple and healthy this week! And it just so happens that this orzo salad with red wine vinegar and olive oil was waiting for me when we got home yesterday. I made it for STAR using these new (super handy) packets of red wine vinegar & olive oil. I am constantly struggling with lunches…if I don’t have leftovers to take to work with me, then I am scrambling for something. Sometimes it’s plain ‘ol turkey and crackers, others it’s a tuna packet and frozen veggies. But it’s never very exciting! So I made this orzo salad with my lunches in mind. It’s easy to make on a Sunday afternoon, package into jars, and then grab in the mornings with the vinegar & oil packets and lunch is done! The beauty is that the red wine vinegar & olive oil can go with just about any veggies and herbs you have on hand so you can swap the flavors around with what you like. And! If you have some leftover grilled chicken or some turkey sausage, heat it up and throw it in when you stir in the vinegar & oil! EVOO & Red Wine Vinegar Single-Serving Portion Packs are available at Food Lion, Safeway, Harris Teeter and online at http://bit.ly/RWEVOOSS. 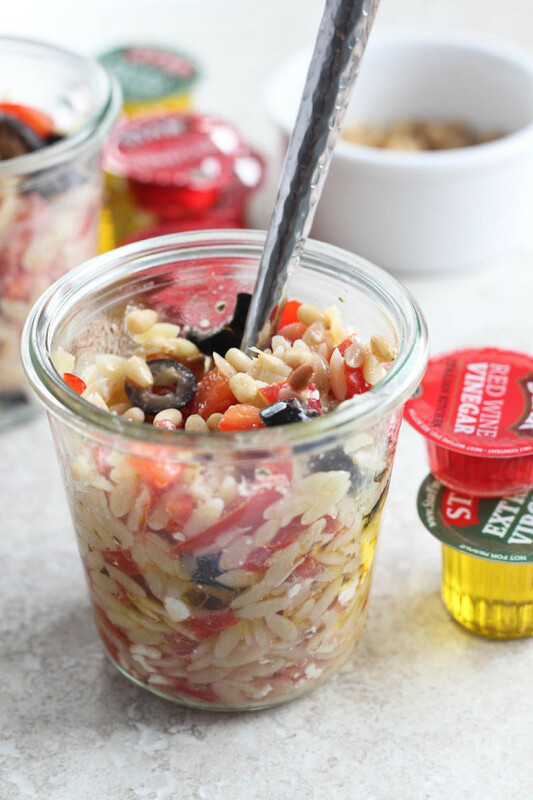 A simple Mediterranean-inspired orzo salad red wine vinegar & olive oil, and packaged for quick weekday lunches. Combine the tomato, bell pepper, olives, artichoke hearts, feta cheese, oregano, garlic powder, salt and pepper in a large bowl and stir to combine. When the orzo is al dente, drain and add to the mixed veggies. Taste and adjust the salt and pepper to taste. Divide the salad evenly among four separate jars or other food containers. Refrigerate for up to one week. When ready to eat, stir in one packet of STAR Red Wine Vinegar (about 2 teaspoons) and one packet of STAR Olive Oil (about 4 teaspoons) and mix well. Top with the pine nuts and adjust the seasonings if necessary. This recipe was developed by me for STAR Fine Foods. Those olive oil packets are awesome! I’ve had too many oil leakages in my bag while trying to carry oil in a Tupperware to work. And this salad is such a great lunch to bring to work! Oh my goodness I didn’t know these packets existed!!!! You are speaking my calorie-counting-portion-controlled love language!!! Just repeat after me…. It will all be worth it. You are almost done with the kitchen and it looks SO good. Love the idea of making this salad for quick and easy and delicious lunches throughout the week! Those packets are genius, too. Lunches are hard for me too, I always end up just having a boring smoothie or soup from the grocery store. I need to get with it! This looks so refreshing, and definitely perfect for a nice, light lunch. 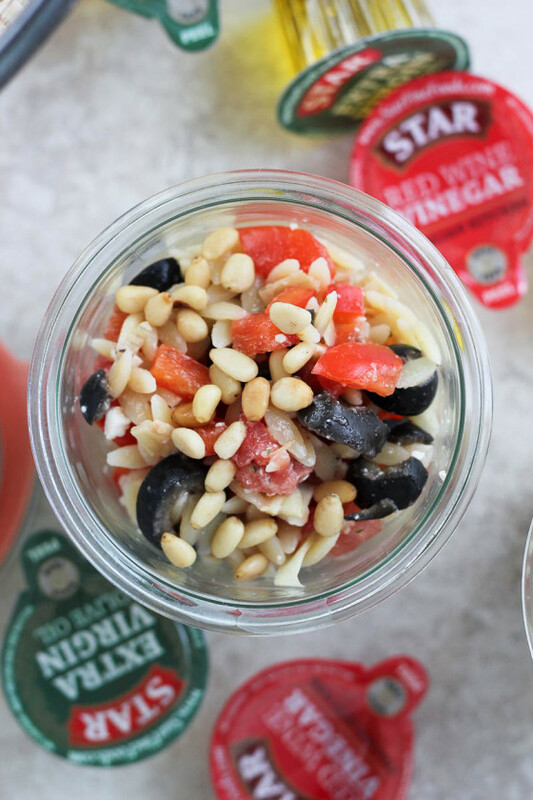 I just love red wine vinegar, it reminds me of sub sandwiches 🙂 and this pasta salad looks so tasty. Can’t wait to give it a try! Love orzo salads, Cassie. This looks scrumptious! I love those little oil and vinegar packets! I can imagine they are a real game-changer when it comes to making salad portable. I’m going to look for them! What?!!! I have never seen these, and they are genius. So genius. Yum salad! I’m a huge fan of a simple oil and vinegar salad dressing. And it’s perfect over your orzo salad! where have these packets been all my life?!! perfect! and I need that salad for lunch soon!! Perfect salad! Orzo is soooo good. Great flavors! Definitely need to make a batch of this salad to have for lunches throughout the week! Love the little packets! I’ve been struggling with lunches lately too! This looks delicious and those packets are genius! WHAT?? Packets?? I LOVE LOVE LOVE this idea! I didn’t even know this existed. Ohmygoodness! I love those tiny packets!!! I’m actually kind of ridiculously excited that those exist! I could tuck those into my purse with my little pocket sized thing of sea salt I carry with me. Yes. I do. Try me the next time you see me. Love this salad! So flavorful and delicious and you have got to love those little packets! So handy! Looks so good! Are the Star products available in mid MO or do you have to do mail order? Hi Jenice! You should be able to find STAR products are area Schnuck’s, Wal-Mart, Sam’s and Dierbergs. Enjoy! Star just sent me some of those last week! 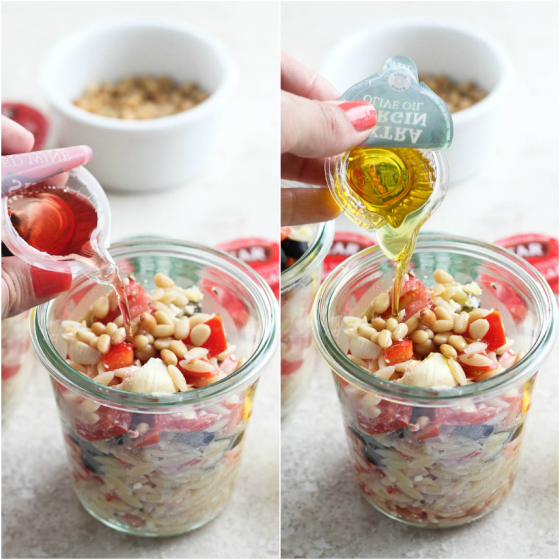 I love how you used them with this yummy orzo salad! Those packets are darling! This salad looks just marvelous! Where have these been all my life?! Finding. Immediately. Hi dear! I totally know how you feel with the torn up house! Our kitchen was the one thing we didn’t do anything to…. yet… Miss you so much! I love this idea for a quick lunch. Working from home, I never plan ahead and then am always stuck at the last minute scrambling. This would be great to have ready! That’s completely new for me! Do you think i can make 5 of these and have one for each day of the working day? Do you think that would e healthy? Those packets are awesome. Great on the go lunch! Thanks Cassie. I’ve been to Walmart and Schnucks but neither in JC has the Star products. I’m giving up and will just mix my own dressing. Love those little packets, and this salad is awesome, exactly what I want for lunch!